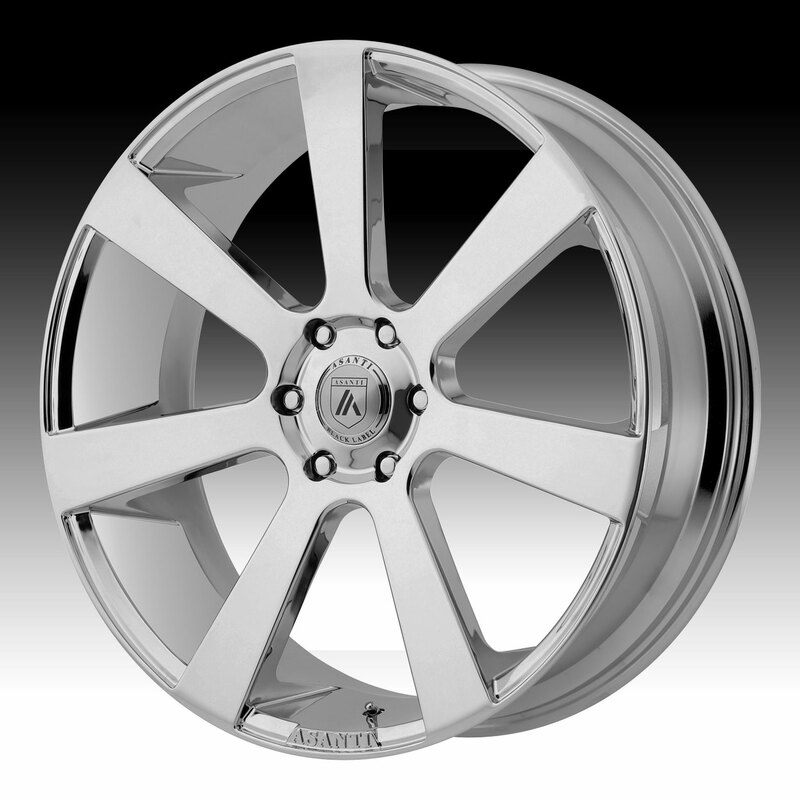 The Asanti ABL-15 chrome wheel is available in 22x9, 24x9, 26x10 and 28x10 sizes. The ABL-15 is available for most trucks, SUV's and RWD passenger cars. Free shipping on all Asanti Black Label custom wheels. Free lug kit with the purchase of 4 Asanti ABL-15 chrome wheels. 22x9 5x115 +15 ABL15-22901515CH $456.00 40 Lbs -->> Call or email for special deals! 22x9 5x120 +35 ABL15-22905235CH $456.00 40 Lbs -->> Call or email for special deals! 22x9 6x120 +35 ABL15-22907735CH $456.00 40 Lbs -->> Call or email for special deals! 22x9 6x135 +35 ABL15-22906335CH $456.00 40 Lbs -->> Call or email for special deals! 22x9 6x139.7 +15 ABL15-22906815CH $458.00 41 Lbs -->> Call or email for special deals! 22x9 6x139.7 +35 ABL15-22906235CH $458.00 41 Lbs -->> Call or email for special deals! 24x9 5x115 +15 ABL15-24901515CH $572.00 44 Lbs -->> Call or email for special deals! 24x9 5x120 +35 ABL15-24905235CH $572.00 44 Lbs -->> Call or email for special deals! 24x9 5x127 +35 ABL15-24905035CH $572.00 44 Lbs -->> Call or email for special deals! 24x9 6x135 +35 ABL15-24906335CH $572.00 45 Lbs -->> Call or email for special deals! 24x9 6x139.7 +15 ABL15-24906815CH $574.00 45 Lbs -->> Call or email for special deals! 24x9 6x139.7 +35 ABL15-24906235CH $574.00 45 Lbs -->> Call or email for special deals! 26x10 6x135 +30 ABL15-26106330CH $775.00 54 Lbs -->> Call or email for special deals! 26x10 6x139.7 +15 ABL15-26106815CH $777.00 54 Lbs -->> Call or email for special deals! 26x10 6x139.7 +30 ABL15-26106230CH $777.00 53 Lbs -->> Call or email for special deals! 28x10 6x135 +30 ABL15-28106330CH $1177.00 59 Lbs -->> Call or email for special deals! 28x10 6x139.7 +15 ABL15-28106815CH $1179.00 59 Lbs -->> Call or email for special deals! 28x10 6x139.7 +30 ABL15-28106230CH $1179.00 59 Lbs -->> Call or email for special deals!